The UK’s On-farm Anaerobic Digestion Community has been working in the last few days to publicize the many benefits of their process which produces biogas. Government seed funding of biogas plant projects can help in a big way, to reduce greenhouse gas emissions from fuel use, in provides jobs, and reduces waste sent to landfill. All these are benefits that it has been publicizing to the government ahead of the annual budget statement later today. The continued adoption of anaerobic digestion, and in particular on-farm anaerobic digestion at small farms at the rate that these plants were being commissioned last year, would maintain a growth surge which it is important continues, so that the UK can meet its commitment to reducing its Carbon Dioxide emissions. 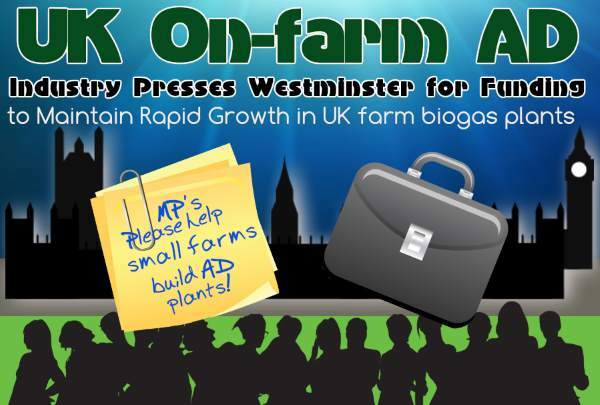 Today in the House of Commons almost 150 farmers will join around 90 MPs and Peers at a parliamentary event aimed at championing the anaerobic digestion industry. Farming representatives from across the UK will join the farming themed event to raise awareness about the technology’s value to their businesses and the rural economy, and to petition politicians for more targeted support for on-farm Anaerobic Digestion operators. “Today’s event is the AD industry’s first ever reception in the Houses of Parliament, and the overwhelming political interest we have received – with almost 90 MPs and Peers requesting to join the event – could signal a marked shift in recognition for the industry’s considerable value. “A growth surge in on-farm AD, with a doubling of plant numbers to 172 over the last two years alone, high lights how much farmers are recognising the benefit of integrating AD into their businesses. To build on this momentum, however, the industry is now seeking support for the considerable non-energy contributions that benefit every UK household, but for which farmers do not receive any recognition. The Government has announced that it will be investing £26.3 billion in science up to the year 2021. This is approximately £6bn per year. This funding is key to the long-term success of the Anaerobic Digestion [AD] sector, as research funding to Anaerobic Digestion researchers via bodies like the Biotechnology and Biological Sciences Research Council (BBSRC), the Natural Environment Research Council (NERC) and the Engineering and Physical Sciences Research Council (EPSRC) is secured. Funding to Innovate UK, the body intended to fund innovation to move research into the commercial world, has already been largely secured for this Parliament. As the Chancellor prepares his budget statement for Wednesday, the AD industry has called for him to recognise the global opportunity for UK companies and researchers in biogas, digestate and bioproducts. Will the UK’s On-farm Anaerobic Digestion industry get the funding assistance they seek? Watch this space, and we will provide an update soon. This article seems to be making the point that the UK government is investing £26 billion on Science, but the UK AD industry has to plead for a mere £25 million on biogas process development. This seems impossibly unbalanced and a huge missed opportunity to UK business in innovativ tech which could be being developed using some of this £26 million. Tell me my interpretation isn’t right! Believe it or not, this does seem to be a fact. There is a huge disparity between the funding on science generally and practical funding for projects at plant operator level, although these are surely the guys who will have some great insights into where research can really pay off! Of course, the EU does fund basic research, so to a degree after Brexit the UK government may be willing to replace that research funding. But will it?